we went to the opening of Benito's Hat today and it was great. It's their 3rd branch and is just behind Top Shop, at no.12 Great Castle Street. Head there if you like Mexican food. I just love Burritos. So filling and yummy! They are delicious and nutritious. 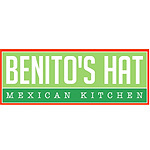 And Benitos Hat in Oxford Circus are doing 2 for 1 on cocktails for all of April. We had a great time and spent the afternoon in the downstairs bit, with friends and their babies/toddlers. In answer to the meme, if you copy and paste my questions then change the font to what you use and obviously the answers it should be ok? The one I copied had indented paragraphs etc so it took a while. Yummy, mexican! I'm feeling hungry now.Bless him in that photo - so cute!